Building a new website is more than just creating the pages. 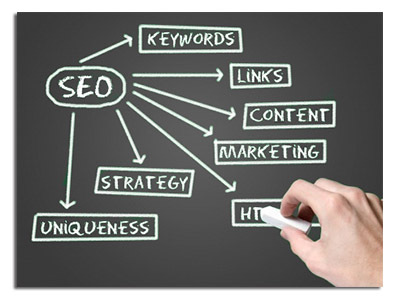 We include basic search engine optimization with every website. Another important feature is being able to track visitors to your website and where you come up on the search engine rankings. We install the tracking software on every website. In addition, to telling us how many visitors and how they got to your website today, it also lets us compare history. Would you like to track your print ads? QR codes help you do this. We can generate a QR code to go on your printed materials and then setup your website to track all the traffic coming in from that QR code. Reaching out to your customers and potential customers is important to businesses. Sending out emails is one way to do this, but you need to do this the right way or you could be flagged as a spammer and everyone hates spam. We can show you show you how to do this the right way by helping you setup an account with one of the leading email marketing campaign venders such as Constant Contact, GoDaddy, or MailChimp. Once you get a new account setup, we can help you generate the code to we can use to allow your customers and potential customer the opportunity to signup for your mailing list right from your website. If you would like, we can also help you setup a template in your email campaign software to make it easy to just add content each month and not have to worry about the overall look of your mailings. Branding and printing promotional materials is important to every business. We will work with your graphic design firm or prepare the graphics for a variety of marketing materials. You can then send these print ready graphics to your promotional materials supplier or use ours (call Select Specialty and ask for Jeannie Noll). We can provide high resolution graphics to match your website. In today's competitive market, social media needs to be an important consideration for all businesses. Everyone has heard about sites like Facebook, Twitter, Pinterest, and LinkedIn, but you might still be confused on which ones can help your business. We can help you figure out which social media sites will best be utilized to drive your business forward taking into consideration your specific products or services. We can also help you get started and setup the key social media accounts for your business. Once the accounts have been setup, we will place links to all your social media sites on your website. This will create a bridge for your customers and potential customers to stay connected and easily find you on the Internet. Blogs are a great way to share information with your customers. We can link your current blog to your website or assist you with creating a new blog.